Discover all the ways that wellness+ helps you save. Earn wellness+ points at Rite Aid on purchases and prescriptions towards savings of up to 20% OFF almost the whole Rite Aid store for a year1. Members-only sale pricing & discounts throughout the store. Just check the weekly ad. Exclusive money-saving offers and information via email. A free program created just for seniors with benefits designed to help them enjoy every day of their life. Including 20% off2 on wellness65+ Wednesdays, a FREE pharmacist consultation and so much more. Now you can earn even more relief at Rite Aid when you buy select allergy products with wellness+ Allergy. Earn $20.00 in wellness+ BonusCash each time you spend $75.00 on OTC allergy products. Enroll in KidCents, and we'll automatically round up your purchases at Rite Aid to the nearest dollar, giving the change to programs for kids in our communities. Chat live with a pharmacist! Members have 24/7 access to professional support. Get weeky ad pricing and save even more with Load2Card coupons. Enjoy 10% off almost the entire store for a year. Get 20% off almost the entire store for a year. An easier way to save, exclusively at Rite Aid! wellness+ Bonus Cash Rewards are digital coupons earned on participating items and promotions throughout the store and online, loaded automatically to wellness+ card only for use in-store or at riteaid.com 6AM day after issuance, and expire after 60 days. Look for the BonusCash badge as you shop. View BonusCash offers on your register receipt. Load & redeem valuable coupons for in-store & online savings using your wellness+ card. View digital coupons in your Load2Card wallet. To enjoy Load2Card, all you need is a FREE wellness+ online account. 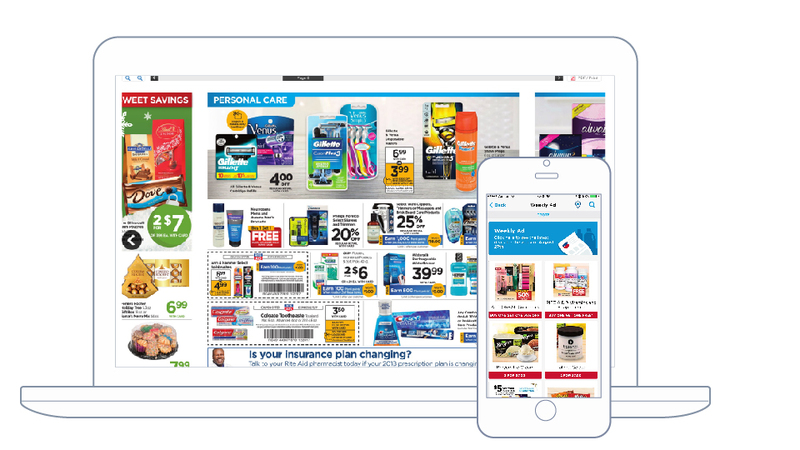 Find the best deals, saving and BonusCash rewards at your local Rite Aid, on any device at any time. 1. Customers earn one (1) Point for every dollar spent on eligible purchases they make when they scan their wellness+ card or enter the phone number associated with the wellness+ card at the register. Points cannot be earned with purchases of Excluded Items, with the exception that customers will earn 25 Points for every non-government funded prescription filled (with the exception of transactions in the states of New York and New Jersey), and 1 Point for every dollar spent on co-pays on government-funded prescriptions (not to exceed 25 Points per prescription). Points will only be earned for money actually spent by the Member; Members will not receive Points, for example, for savings from Discounts, or from Manufacturer Coupons, which result in a reduction of their out-of-pocket costs for eligible purchases. Other limitations and/or restrictions may apply based on state law or other applicable requirements. Points will be reset to zero (0) on January 1 of each calendar year, but Members will maintain any earned Bronze, Silver, and Gold tier level through the end of the next calendar year. If you void a purchase or return your purchase, Rite Aid will deduct the Points that were awarded for that purchase from your wellness+ account; this could potentially result in a negative BonusCash balance in your account. You can check your Points balance here. Through its wellness65+ program (“wellness65+”), Members over 65 years old can receive 20% off certain purchases made on Wednesdays. To qualify, a Member must specifically enroll in the wellness65+ and be a wellness+ Member and at least 65 years old on the date of enrollment. How do I use my BonusCash rewards? Your rewards will automatically deduct from your next eligible transaction at Rite Aid. Your transaction total (after discounts or coupons) must exceed the amount of BonusCash rewards you have. For example, if you have a $10 BonusCash reward, your transaction total must exceed $10.00 in order for the reward to be used. Exclusions apply. How can I see the BonusCash rewards that I’ve earned? BonusCash rewards will print on your receipt during the transaction that you earn them. You can also just ask an associate next time you’re in one of our stores. They are not currently available on your monthly wellness+ statement. Do my BonusCash rewards expire? BonusCash rewards expire 60 days after they are issued.